Our charming traditionel riad is located 15 minutes away from the famous Jemaa El Fna square, in the prestigious area of Bab Doukkala, nearby the Royal Palace Dar El Bacha and the shops, restaurants and souks. The riad is easily accessible by car. 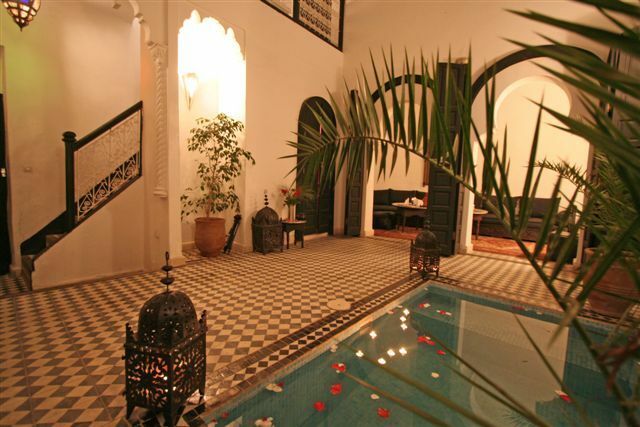 Upstairs, 2 air-conditioned bedrooms, located at the extremities of the corridor overlooking the riad. The Ouared bedroom: air-conditioned almond-color room with bathroom in blue tadelakt, brass washbasin and toilets. The Jouge bedroom: a spacious rectangular air-conditioned room with small living room, a bathroom in green tadelakt, and toilets. Another staircase leads to the Tlata room, an air-conditioned room that dominates the riad, with a bathroom in azure-blue tadelakt and toilets. On the top of the Riad, enjoy a panoramic view of the Medina and its gardens. - Service provided (house cleaning, breakfast and meals). - Beds are done every day. toilet, shower, Bathroom in green tadelakt, and toilets. toilet, shower, Bathroom in blue tadelakt, brass washbasin and toilets. We have internet 3G key at your disposal. Everything was nice. Nothing overly fancy. Great housekeeper. Nice location. Convenient but quiet. Our family of four people enjoyed our stay at the Riad Zarana. It was an authentic Marrakech place to stay and it was safe. We also enjoyed the great services of Rabia. She was always helpful and pleasant. The assistance we received for transportation from and to the airport is greatly appreciated even though it was late upon our arrival at the airport. We enjoyed our stay at this Riad, away from the crowds and noise of the Medina but close to walk there within minutes. Rabiah spoilt us with her excellent cooking. Thank you for staying with us ... thrilled you enjoyed your stay. Would love to host you again. The pool in the Riad may need some maintenance (water level dropped several inches overnight). Parfait pour quelques jours à Marrakech ! Un Riad à 15 minutes de marche de Jemaa el Fna, parfait pour 6. L'accueil a été parfait dès l'arrivée de l'aéroport (je recommande de prendre un transport avec la propriétaire du Riad), jusqu'au Riad accueilli par Rabia. Quel plaisir d'avoir Rabia au Riad : une belle personne, toujours aux petits soins, et quelle cuisinière ! On va fini par diner tous les soirs au Riad. Pour le plus factuel : chambres parfaitement adaptés à un court séjour, le tout fonctionnel, propre, élégant, raffiné. Oui, le bassin est petit mais il participe à l'ambiance plus qu'autre chose (ce n'est pas une piscine). Bonjour, nous avons beaucoup apprécié notre séjour au Riad Zarana, l’acceuil chaleureux et inoubliable de Rhabia avec son jus d’orange pressé au petit déjeuner et elle fait bien le tajine. Bonjour Ronni, Rabia et moi vous remercions pour votre message qui nous fait tres plaisir ! This charming riad, is located in a quiet street, only 15min on foot from Jemaa El Fna square.